"The dream of yesterday is the hope of today and the reality of tomorrow." The Goddard Memorial Association is dedicated to the memory of Robert Hutchings Goddard, a native of Worcester, Massachusetts. Dr. Goddard was educated at South High School, WPI and Clark University. As a true pioneer, he developed and successfully launched the first liquid-fuel rocket and is recognized internationally as the "Father of Modern Rocketry." His patented innovations in rocket design made space travel possible. The purpose of the Association is to bring recognition and honor to Dr. Robert H. Goddard for his contributions to the modern space age. It is further dedicated to naming Worcester, Massachusetts as the "Birthplace of the Space Age." The Goddard Memorial Association, a non profit organization, has succeeded in completing a long overdue permanent memorial to Worcester native and Father of the Space Age, Robert Hutchings Goddard. 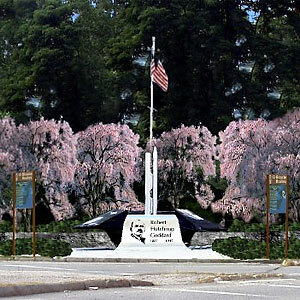 The memorial site, located at the corner of Apricot Street and Goddard Memorial Drive in Worcester, MA, has as its focal point an eight paneled monument that presents highlights of Goddard's life and explains his pioneering inventions.